For the American Triple Crown, see Triple Crown of Thoroughbred Racing (United States). The Triple Crown of Thoroughbred Racing, often shortened to Triple Crown, comprises three races for three-year-old Thoroughbred horses. Winning all three of these Thoroughbred horse races is considered the greatest accomplishment in Thoroughbred racing. The term originated in mid-19th century England and nations where thoroughbred racing is popular each have their own Triple Crown series. 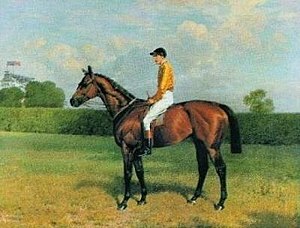 Since the 2,000 Guineas was first run in 1809, fifteen horses (including three winners of substitute races at Newmarket during the First World War) have won the English Triple Crown. The most recent – and only winner since World War II – was Nijinsky, in 1970. For many years, it was considered unlikely that any horse would ever win the English Triple Crown again. In the winter of 2006/2007, however, trainer Jim Bolger was training his unbeaten colt Teofilo for the Triple Crown and bookmaker William Hill plc was offering odds of only 12/1 against Teofilo winning the 2007 Triple Crown. The horse was withdrawn from the 2000 Guineas two days before the race after suffering a setback and never raced again. Since Nijinsky, only Nashwan (1989), Sea the Stars (2009), and Camelot (2012) have won both the Guineas and the Derby. Between Reference Point in 1987 and Camelot in 2012, no Derby winner (not even the potential Triple Crown winners Nashwan and Sea the Stars) even entered the St. Leger. This reluctance to compete in the St. Leger is said to be because of the impact it would have on a horse's stud value in a market where speed is preferred to stamina. †Wartime winners Pommern, Gay Crusader and Gainsborough are not counted, according to many judges, as the three races were all held at Newmarket and racing itself was too disrupted. By this reckoning, there were only 12 triple crown winners, and only three in the 20th century. The Lonsdale Cup, raced over 2m 1/2f during the Ebor Festival. The has seen renewed interest in recent years with a bonus of £1million being offered to the victor of all three races and one of 8 qualifying race (4 in 2018). This was claimed by Stratavrious in 2018 after his victory in the Yorkshire Cup and three aforementioned races. Only one filly won this version of the Triple Tiara, Davona Dale in 1979. Few have even tried as the short time between the Kentucky Oaks and Black-Eyed Susan is generally considered too short for fillies. In 2010, the NYRA changed the configuration of the Triple Tiara to include the Alabama Stakes instead of the Mother Goose. Thus far, no filly has won the reconfigured Triple Tiara. All three races are run at the Curragh. For a list of the annual individual race winners, see Irish Triple Crown race winners. The Canadian Triple Crown was established in 1959 and since then seven horses have won it. In 2014, the Hall of Fame decided to honor the five horses who had won the three races before 1959, meaning 12 horses are now officially recognized as winning the Canadian Triple Crown. AJC Australian Derby (2400 m). The three-year-old Triple Crown initially included the Canterbury Guineas (1900 m) but nowadays the first leg is the Randwick Guineas. Only one horse has won the German Triple Crown, Königsstuhl in 1979. No filly has ever won the series. Belgium's Jockey Club does not (or will not) disclose histories of its Triple Crown races. It is not known if the lists above are complete, and it is not known if any of the above races are still being run in Belgium. The last Derby Belge for which there is any known record was in 2011, when the race was won by German-bred Revanta. No filly has swept the Hungarian Fillies' Triple Crown. One horse has won the Swiss Triple Crown. No filly has swept all three races. The Dutch Triple Crown races, except the Dutch Derby and possibly the Dutch Oaks, have not been run since around 2008. The three races that comprise the Indian Triple Crown are the Indian 2000 Guineas, the Indian Derby and the Indian St Leger, all run at Mahalaxmi Race Course in Mumbai. The 2000 Guineas is run in December, and the Derby on the first Sunday of the following February. The St Leger is usually run in April; between 1970 and 1990 it was run at Pune, before being shifted to Mumbai. It is now again being run in Pune. Three-year-old horses are eligible for the Turkish Triple Crown. In Hong Kong, there are two other Triple Crown series, the Hong Kong Speed Series and the Four-year-old Series. The Triple Crown series consists in three races at increasingly longer distances. No filly has swept all three races, but Jacopa de Sellaio (ITY) won the Premio Parioli, Derby Italiano, Premio Regina Elena, and Oaks d'Italia in 1932. In 2010, Luen Yat Forever become the first and, to date, only horse to win the Macau Triple Crown. Gran Premio Nacional (8 1/2 furlongs). All three races are contested at Hippodromo de las Americas, in Mexico City. Clasico Diamante (8 1/2 furlongs). El Derby, Valparaiso Sporting Club. No filly is known to have won the Polish Fillies' Triple Crown, which would conclude with the St. Leger. The Polish St. Leger is now open to 3-year-olds and up. The following horses won their Triple Crown when still undefeated. Those marked with an asterisk retired undefeated. ^ Waterman, Jack (1999). The Punter's Friend. Harpenden, Herts, UK: Queen Anne Press. ISBN 1852916001. ^ "Irish Triple Crown of Horse Racing | International Triple Crown Races | UK Horse Racing". HorseRacing.co.uk. Archived from the original on 2012-10-18. Retrieved 2012-06-20. ^ "WEG, Hall of Fame announces grandfathering of Canadian Triple Crown winners". Woodbine Entertainment Group. 4 July 2014. Retrieved 19 July 2014. ^ "WEG, Hall of Fame Announces Grandfathering of Canadian Triple Crown Winners". Canadian Horse Racing Hall of Fame. 4 July 2014. Retrieved 19 July 2014. ^ "Canadian Hall of Fame Honors Early Triple Crown Winners". Blood-Horse. 4 July 2014. Retrieved 19 July 2014. ^ "Australian Triple Crown". Races.com.au. Retrieved 24 May 2012. ^ "SMH Sport". The Sydney Morning Herald. 11 April 2009. Retrieved 12 April 2009. ^ Ken McLean (2005). Designing Speed in the Racehorse. Russell Meerdink. p. 246. Retrieved 20 June 2012. ^ "2013 Yılı At Yarışları Genel Hülümleri" (PDF) (in Turkish). Jockey Club of Turkey. Retrieved 2013-07-11. ^ "Kyoto: Orfevre going for Japanese Triple Crown | Daily Racing Form". Drf.com. Retrieved 2012-06-20. ^ "Terrific line-up for Stewards' Cup : International Horse Breeding and Racing news updated daily, www.thoroughbrednews.com.au". Thoroughbrednews.com.au. 2006-01-20. Retrieved 2012-06-20. ^ "Luen Yat Forever Wins Triple Crown". Racingandsports.com.au. Retrieved 2012-06-20. ^ "Triple Crown familiar term around the world". Drf.com. 2012-06-16. Retrieved 2012-06-20. ^ "Chilean star Matto Mondo joins Mandella stable". Thoroughbred Times. 2008-01-19. Retrieved 2012-06-21. ^ "Stallions :: Sicotico". Rancho San Antonio. Retrieved 2012-06-20. ^ a b c d e "Caribbean stakes series begins Saturday in Puerto Rico - Horse Racing - ESPN". Sports.espn.go.com. 2008-12-06. Retrieved 2012-06-21. ^ Godfrey, Nicholas (20 November 2014). "Triple Crown winner Sir Fever reportedly sold". RacingPost.com. Archived from the original on 2014-11-29. Retrieved 21 November 2014. ^ "La Triple Corona se inicia hoy". 29 August 2009. Retrieved 20 May 2018. ^ "Sid Fernando commentary: Revenge of Bambera". Thoroughbred Times. 2011-04-19. Retrieved 2012-06-21. Williams, Guy St. John; Francis P. M. Hyland (1980). The Irish Derby 1866–1979. London and New York: J. A. Allen & Co Ltd. ISBN 0-85131-358-2.